Item description: Entry, 3 January 1862, from the diary of Thomas Bragg (Attorney General of the Confederate States of America, 1861-1863) written while Bragg was in Richmond, Va. This entry comments on the Trent Affair and foreign relations and relates war news, including a mention of the Battle of Port Royal Ferry. Item citation: From folder 1 of the Thomas Bragg Papers, #3304-z, Southern Historical Collection, The Wilson Library, University of North Carolina at Chapel Hill. Seward’s reply to L’d Lyons’ demand was published in this mornings Enquirer. It is a labored production and seems intended rather for home use & to satisfy the Northern mind than anything else. He labors to shew that Cap. 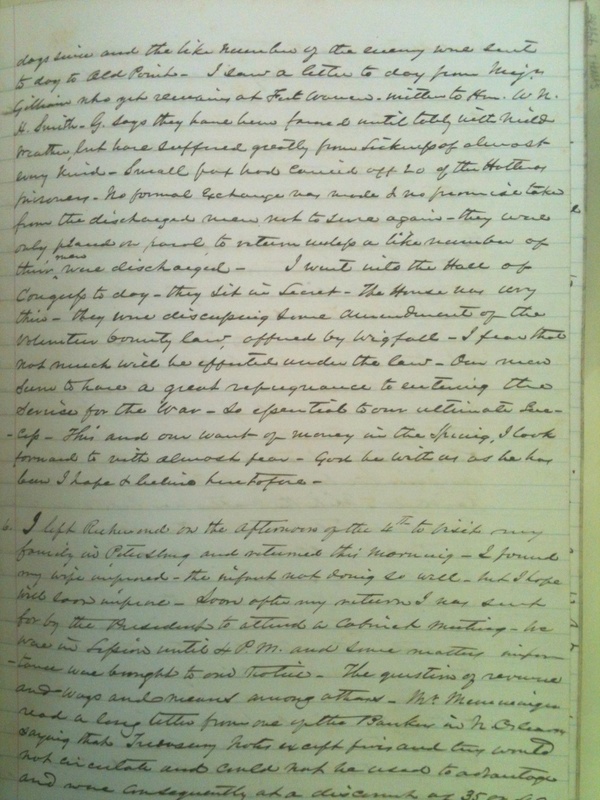 Wilkes might lawfully have seized the Trent & had her brought before a court of Maritime jurisdiction, the only mode of testing the question, though incidentally, whether the Commissioners were to be put upon the footing of things contraband, which he insists was the cause – He says the President – upon mature consideration, has come to the conclusion that, as that was not done, the capture of the Commissioners was not Stricti Juris, authorized under the circumstances. 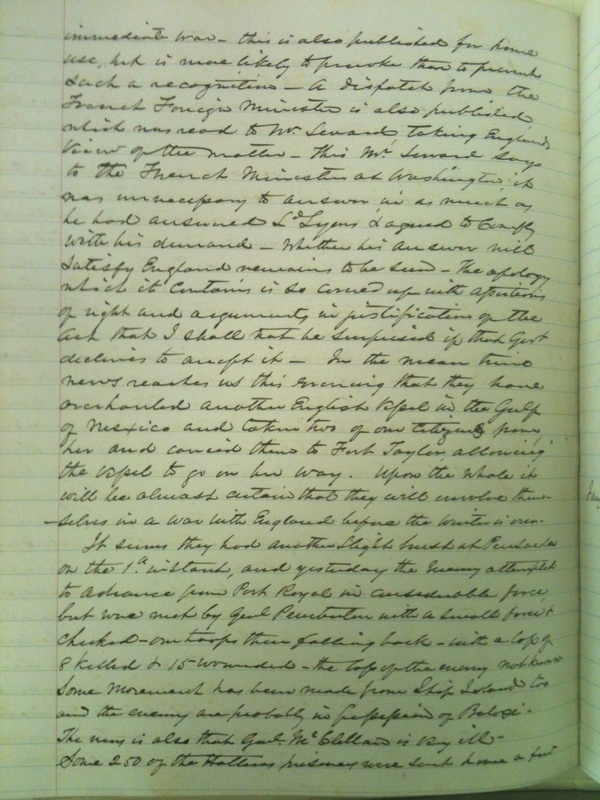 In the latter part of his letter however, he says he is happy to comply withe the demand, because in doing so the Government is but carrying out a principle long contended for by the United States, alluding to the only claim of England as to searching the vessels of neutrals &c. He concludes by informing Lord Lyons that the “persons” demanded will be surrendered when & where he desires – His Lordship says he will confer with him in person on the subject. A dispatch this evening says they probably sailed from N. York on the first. In a dispatch to the American Minister at London he says that any recognition of our independence by a foreign Gov’t will be followed by immediate war – this is also published for home use, but is more likely to provoke than to prevent such a recognition – A dispatch from the French Foreign Minister is also published, which was read to Mr. Seward, taking England’s view of the matter. This Mr. Seward says to the French Minister at Washington, it was unnecessary to answer, in as much as he had answered L’d Lyons & agreed to comply with his demand. Whether his answer will satisfy England remains to be seen. The apology which it contains is so covered up with assertions of right and arguments in justification of the act, that I shall not be surprised if that Gov’t declines to accept it – In the mean time news reaches us this evening that they have overhauled another English vessel in the Gulf of Mexico and taken two of our citizens from her and carried them to Fort Taylor, allowing the vessel to go on her way. Upon the whole it will be almost certain that they will involve themselves in a war with England before the winter is over. It seems they had another slight brush at Pensacola on the 1st instant, and yesterday the enemy attempted to advance from Port Royal in considerable force, but were met by Gen’l Pemberton with a small force & checked – our troops then falling back – with a loss of eight killed & 15 wounded – the loss of the enemy not known. Some movement has been made from Ship Island too and the enemy are probably in possession of Biloxi. The news is also that Gen’l McClellan is very ill. Some 250 of the Hatteras prisoners were sent home a fed days since and the like number of the enemy were sent today to Old Point. I saw a letter today from Maj’r Gilliam, who yet remains at Fort Warren – written to Hon. W.N.H. Smith. G. says they have been favored until lately with mild weather, but have suffered greatly from sickness of almost every kind. Small pox had carried off 20 of the Hatteras prisoners. No formal exchange was made & no promise taken from the discharged men to to serve again – they were only placed on parole to return unless a like number of their men were discharged. I went into the Hall of Congress today – they sit in secret. 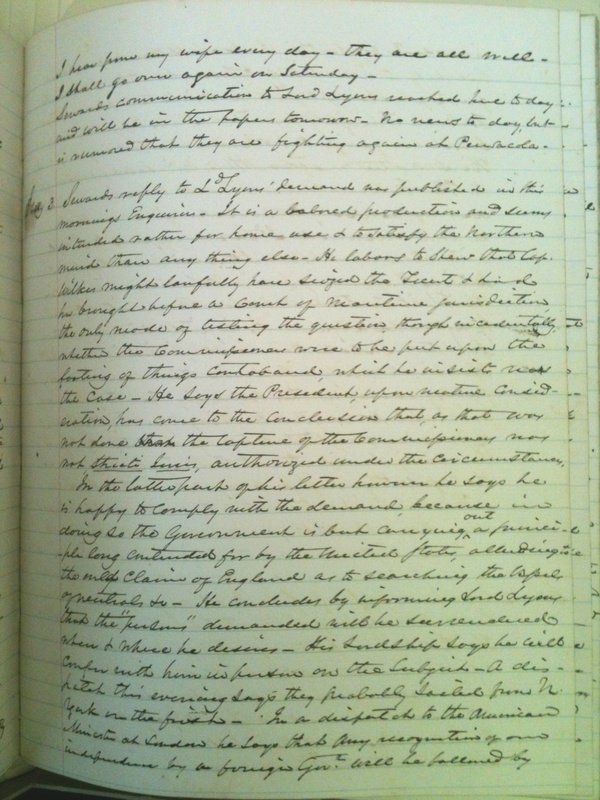 The house was very thin – they were discussing some amendment of the volunteer bounty law, offered by Wigfall. I fear that not much will be effected under the law. Our men seem to have a great repugnance to entering the Service for the War – so essential to our ultimate success. This and our want of money in the Spring, I look forward to with almost fear. God be with us, as he has been & believe heretofore. This entry was posted in Southern Historical Collection and tagged attorney general, Confederate States of America, England, foreign relations, Richmond, Thomas Bragg, Trent Affair, Virginia. Bookmark the permalink.